Soil color is deceiving and does not indicate the fertility; and the darkest may be poorest in nutrients. While grasses will survive without fertilization, they will not do so and look and perform to the standards we set for them today. 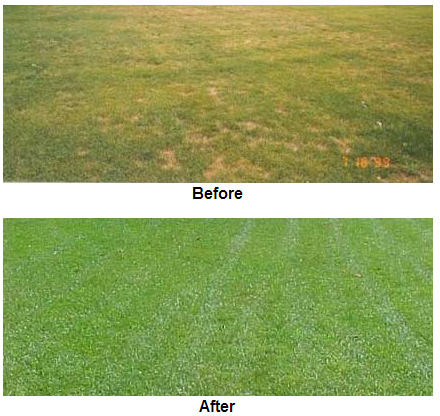 A healthy, green, lush lawn is generally a result of a correct fertilization program. A minimum lawn fertilization program--one that will produce acceptable home turf for most people--is to fertilize warm season grasses twice a year, and cool season grasses three times a year. Warm season grasses like bermudagrass and St. Augustine grass should be fertilized in May-June, and again in September-October. Cool season grasses such as tall fescue, Kentucky bluegrass and perennial ryegrass should be fertilized in March, in May and again in September-October. There are many different lawn fertilizers available on the market. A fertilizer containing nitrogen, phosphorus and potassium, in that order, is often referred to as a complete fertilizer. An example might be 16-8-8, a turf fertilizer which contains 16 percent nitrogen, 8 percent phosphorus and 8 percent potassium. Regardless of the mix of elements, nitrogen is the most important element in the bag for turfgrass fertilization. For that reason, the amount of fertilizer to apply to your lawn is based on nitrogen. Besides their nutrient analyses, fertilizers differ in how they make their nitrogen available to grass roots. Fast release of soluble fertilizers are usually the lest expensive. 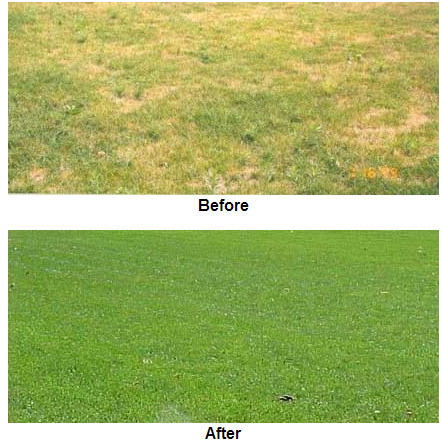 They can provide a quick greening response for a relatively small amount of product applied. However, they can burn your lawn if you apply them improperly, and they are used up more rapidly than some other types of fertilizers. Ammonium sulfate and ammonium nitrate are examples of fast release or soluble fertilizers. 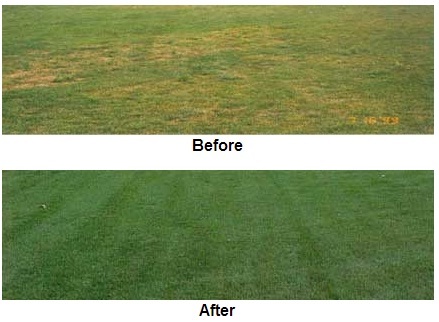 Slow release chemical fertilizers allow nitrogen to become available over longer periods of time than do soluble fertilizers, and they won't burn the lawn even when applied at relatively high rates. However, slow release fertilizers are comparatively expensive, and their release rates can vary depending on the amount of water you apply, the temperature, or the activity of soil microorganisms. Natural organic materials may also be used a s lawn fertilizers. Examples are animal manures and compost. Although safer because they aren't as likely to burn turf, you have to apply relatively large amounts of them to obtain the required amount of nitrogen needed. Some of the manures may contain weed seeds and harmful salts, and some may have unpleasant odors. They do release nutrients over an extended period of time. Fertilizing by hand can be effective, but a mechanical spreader is easier, safer an more accurate for most home gardeners. The two general types of mechanical spreaders available are the broadcast (cyclone or rotary type) spreader, and the drop spreader. To achieve the most even distribution, spread half the fertilizer in one direction, and the other at right angles to the first.